As promised we will be posting the reflections that are also available in print form at both sites. Contributors are members of Easter’s newly formed Spiritual Life Team. Out goal is to assist people in amplifying their spiritual life by teaching about the power of prayer through many different avenues. To learn more about prayer and growing your spiritual life, follow this blog. We encourage you to use these reflections as you pray for Easter’s Capital Appeal and our vision for the future of Easter Church. These reflections are meant to guide you as you prayerfully think about the appeal over the next few weeks. Reflection 1: Let it Shine! You’re not hiding your light under a bushel, are you? 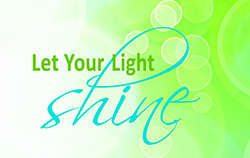 What are some of your gifts that you can uncover and let shine? Prayer: Dear God, thank you for giving us each unique gifts to use to your glory. help us to see that those gifts are for sharing and help us let our own lights shine for you. This entry was posted in Capital Appeal 2013, Prayer, Shine. Bookmark the permalink.